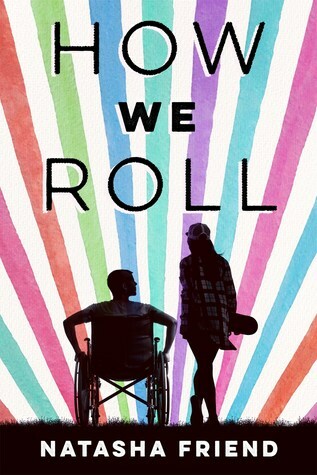 Quinn is a teen who loves her family, skateboarding, basketball, and her friends, but after she's diagnosed with a condition called alopecia which causes her to lose all of her hair, her friends abandon her. Jake was once a star football player, but a freak accident—caused by his brother—he loses both of his legs. Quinn and Jake meet and find the confidence to believe in themselves again, and maybe even love. I don't really know what to say about How We Roll, because to be frank, I don't really feel like a read a book. The best way I can describe How We Roll is to say that it felt incomplete. There was a lot of potential with this one but ultimately it felt like every aspect of the story was incomplete. Like this is the bones of a great story, waiting to beefed up. There are a lot of great elements to this book. Quinn has alopecia and her little brother has autism. Jake was a star football player who loses his legs in an accident, and harbors a lot of resentment for the other person involved. So many interesting concepts, so much to learn from! If only they had been fleshed out. Don’t get me wrong, this is a cute book. In the short time we know Quinn and Jake, there is a bit of growth. I just wish we’d gotten more out of it. These characters were interesting, but I just walked away feeling like we missed out on something.